„This has to be one of the best skiing seasons ever“, commented Andi Ruetz when we visited him in Sport Ruetz on the penultimate day of the 2018 season. The snow management in Westendorf is superb with piste teams maintaining top conditions throughout the winter. 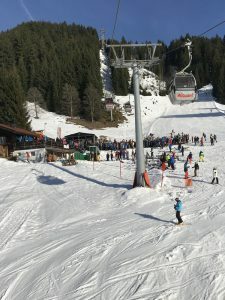 Westendorf sits on a plateau in the sunny tirolean Brixen valley and is a very popular resort. It is an ideal starting point for winter-sports fans being an important link between the huge SkiWelt Wilder Kaiser Brixental (one of the world’s largest and modern ski areas) and the famous Kitzbühel / Kirchberg region. 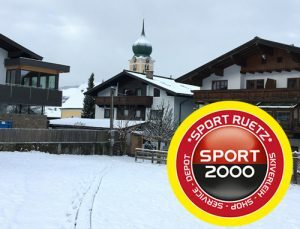 The village of Westendorf has much to offer and our modern, luxuary apartments at Sport Ruetz are right in the centre. Snowboarders and freestylers can find one of the best funparks in Austria here – the boarders playground. Ski and snowbaoard fun knows no limits in Westendorf from the start of the winter season right through to Easter and the start of spring. Highlights alongside the pistes are the excellently prepared cross country ski routes and the well prepared and maintained winter walking paths through beathtaking, peaceful, winter landscapes. Our superbly equipped apartments make for an easy to manage, trouble-free winter holiday. The village of Westendorf offers top-class restaurants and abundant night life with transport links to nearby facilities. Breakfast in Westendorf, put on your skiis just outside the apartment and you’re off. Morning coffee and Torte at the top of Talkaser. Wienerschnitzel for lunch with friends above Kitzbühel. Stop off for refreshments in the afternoon in Hoch Söll, Après-Ski at the Bruchstadl back in Westendorf. Park your boards and skiis overnight in our free heated ski-depot. Check how many km you have clocked up on the website. Enjoy. Family Skiing in Westendorf, Austria. Westendorf is an elderado for beginners and advanced winter-sports fans but is also super for young families. „Etiquette on the mountain is second to none. People stop and help if children fall or look distressed. They even help adults! Having said this, it is slightly different at the lifts especially first thing in the morning. Subscribe to the Ruetz Westendorf Apartments RSS News service. Receive notification when news items are published. Click here… and save to your Email reader or bookmarks.